This salad was inspired by the one served at a local Mexican Restaurant that I first went to a few years back now. I was first introduced to the salad while at lunch with my Sister-in-Law and Aunt. I think it was of the best salads that I had ever eaten. And that's saying a lot since I have eaten my fair share of salads over my lifetime. I've haven't been back to that restaurant in a good long while. Maybe that's because a couple of years back I cracked the code on their salad! 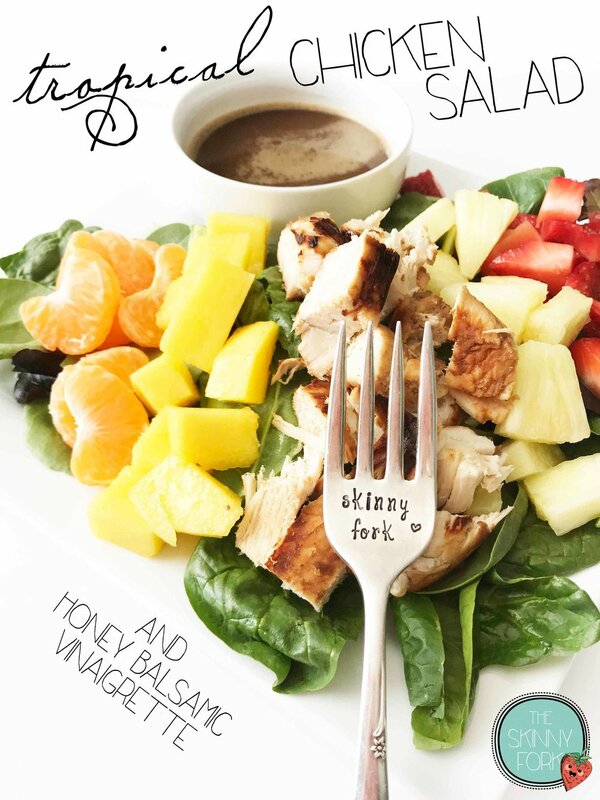 One of my favorite things about this salad is the vinaigrette. Seriously. I could eat it with a spoon. My mouth is watering even now just thinking about it. It's sweet, tangy, and so refreshing on a hot summer day when paired with this salad. The spring mix of lettuce is nearly overwhelmed with tropical fruits that are fresh cut and piled high. Did I mention that this vinaigrette is a great marinade too? Marinade anything from meat to strawberries. Yes, strawberries are delicious fter being soaked in this vinaigrette for a few hours! Being as it's a great marinade, that's what I marinade the chicken for this salad in prior to grilling. I could almost eat this salad every day. It's fabulous and filling! It's definitely a summer love of mine. Another great thing about this salad is that you could make it ahead as a meal prep; just keep the dressing separate from everything else until you're ready to enjoy! 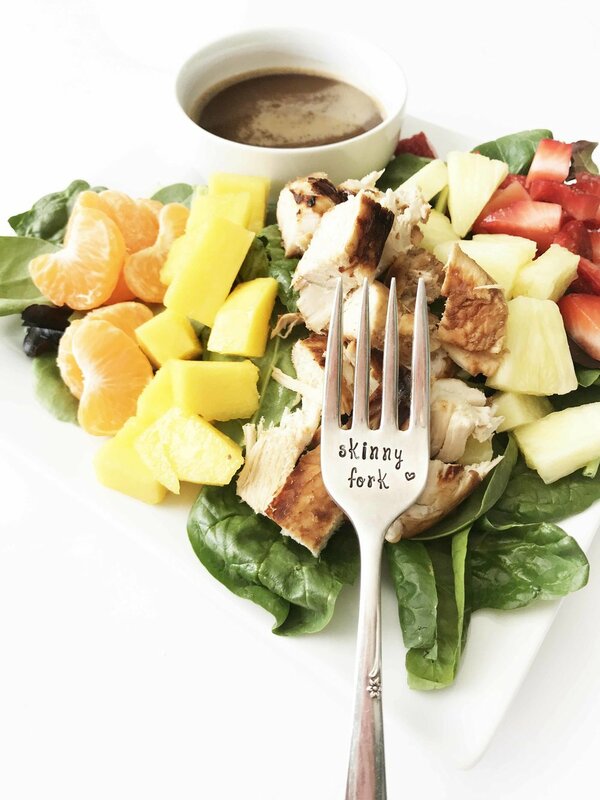 A tropical inspired salad with a marinated and grilled chicken breast on top and loaded with fruit, fruit, and more fruit! Since half of the vinaigrette is discarded I have adjusted the nutritional count to reflect that. Mix the 1/2 C. balsamic vinegar, 1/4 C. honey, 1/4 C. olive oil, and 1 1/2 Tsp. coconut aminos together in a small bowl until well combined. Reserve half of the vinaigrette into a small airtight container and store in the fridge until later. Put the remaining half of the vinaigrette into a ziplock bag or shallow dish with the 1 Lb. chicken breasts and 4 garlic. Allow the chicken to marinate for at least one hour and up to a full day. When ready, remove the chicken from the bag and discard the marinade; season with some salt and pepper. Grill the chicken until cooked through. 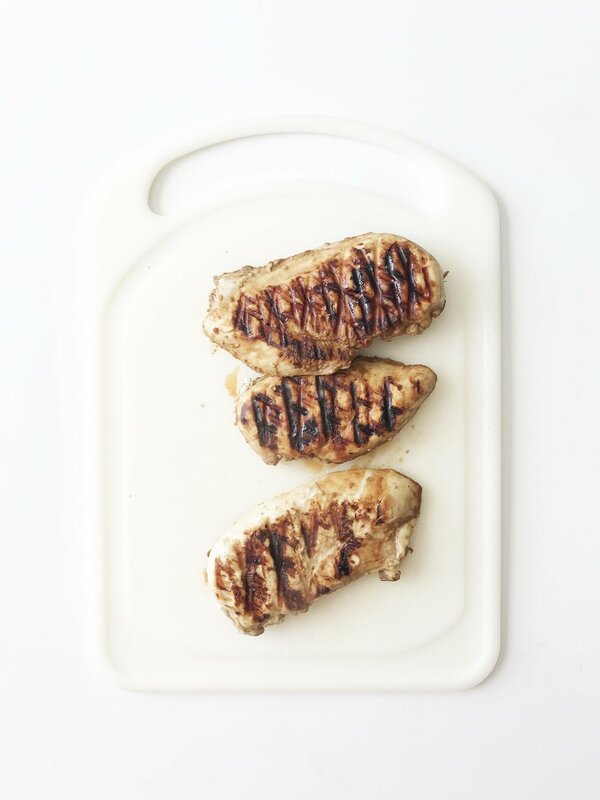 I used my counter top grill for about 5-6 minutes with my particular chicken breasts. 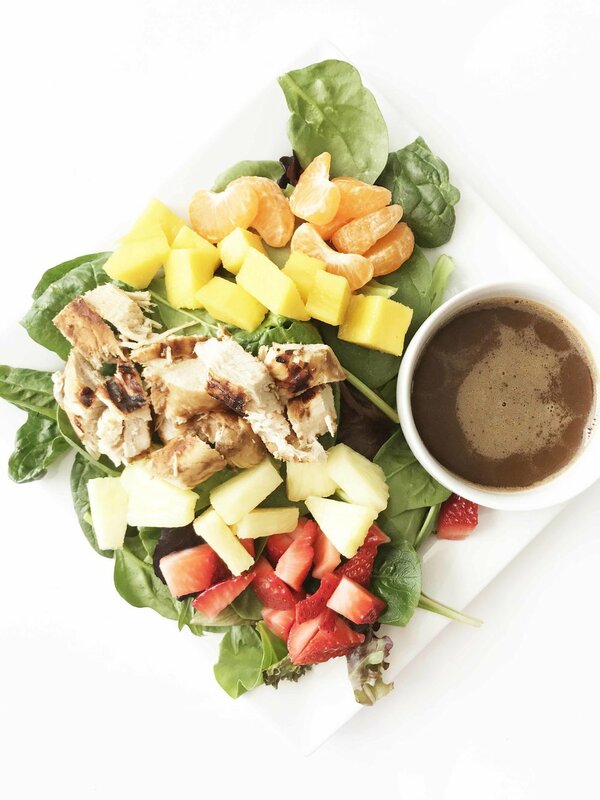 While the chicken is cooking, divide the greens between 4 plates and top each with about 1/4 C. of each fruit; totaling about 1 C. of fruit per salad. When the chicken is done, allow it to cool slightly before slicing or cutting and place atop the salad. Remove the vinaigrette from the fridge and spoon about 2 tbsp. of the dressing over each salad.